At a deed-signing ceremony earlier this week, farmers Art and Helen Tanderup transferred to the tribe a 1.6-acre plot of land that falls on Ponca "Trail of Tears." Now, as the Omaha World-Herald explained, rather than battling the farmers, "TransCanada will have to negotiate with a new landowner, one that has special legal status as a tribe." 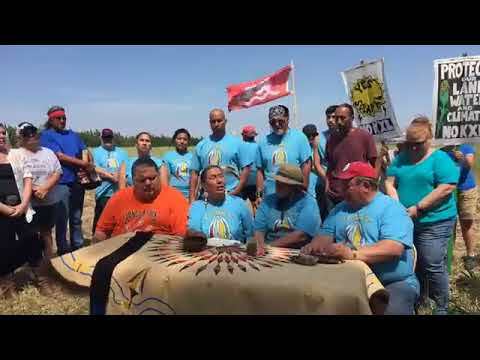 The transfer was celebrated by members of the Ponca Tribe as well as environmental advocates who oppose the construction of the pipeline and continue to demand a total transition to renewable energy. "We want to protect this land," Larry Wright Jr., the chairman of the Ponca Tribe of Nebraska, told the World-Herald. "We don't want to see a pipeline go through." "While TransCanada is trampling on Indigenous rights to fatten their bottom line, Native leaders are resisting by building renewable energy solutions like solar panels in the path of the pipeline," said 350.org executive director May Boeve. "Repatriating this land to the Ponca Tribe raises new challenges for the Keystone XL pipeline and respects the leadership of Native nations in the fight against the fossil fuel industry," she added. "Tribal sovereignty is central to the movement to keep fossil fuels in the ground and build a more just society for all." Author and 350.org cofounder Bill McKibben called the land transfer an "important strategic move," while also noting that "it's sacred ground." In recent years, the Tanderups have worked with Ponca leaders to grow the tribe's sacred corn on the land that's now been returned. The signing ceremony featured the fifth planting of the corn and a performance by Ponca singers and grass dancers. "It's an honor to be here today to celebrate this gracious and generous donation nation to the Ponca Nation," Wright said at the ceremony. "This event is another step to healing old wounds and bringing our people together again to a land once ours." The Tanderups—who have joined with Indigenous and environmental advocates to protest Keystone XL—said the possibility of blocking the pipeline was only one of the factors that contributed to their decision. "The Ponca and people of this community continue to build strong relationships as they work in collaborative efforts," Art Tanderup told the Norfolk Daily News. "It is only fitting that out of the tragedy of the Ponca Trail of Tears that a small piece of this historic trail be transferred to them."